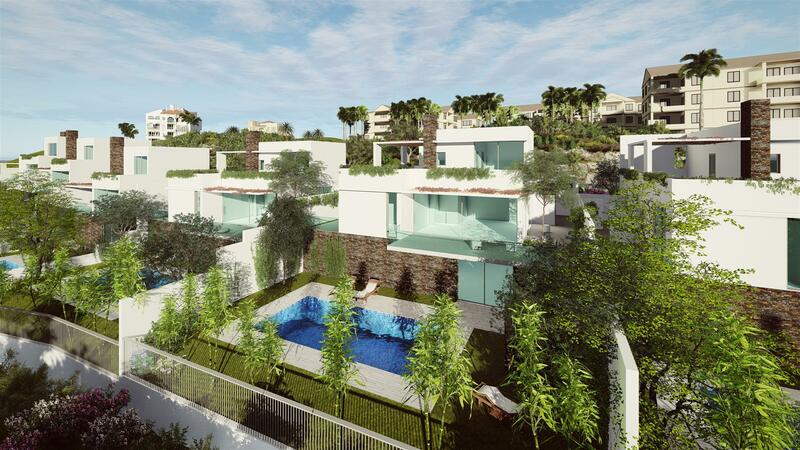 New luxury contemporary villas of 4 bedrooms, private pool, gardens, enjoying a superb location in La Cala Hills, the Mijas Golf Valley, only 8min to La Cala’s most beautiful Beach. It is set out in a privileged environment surrounded by golf courses, combining the advantages of living in a peaceful and natural setting but central, to be close to the beach and to the main areas of the Costa del Sol within 10 minutes. The high elevation of the land allows to enjoy superb views. The development consists of 6 independent contemporary Mediterranean style villas built to the highest quality and design standards and finishes, obtaining natural light and privacy. The design features 4 spacious bedrooms, 3 bathrooms integrated in an open plan living space; distributed on 2 floors and a basement area from 60sqm-80sqm with direct access to the pool. Enjoy privacy in the private master bedroom with en-suite on the top floor including a large terrace and solarium. The main living area includes 1 master bedroom with bathroom en suite and 2 large bedrooms all with private access to a terraced area. All rooms come with large windows and spacious bright interiors. Located in La Cala Hills urbanisation, in the famous Mijas golf valley only 10 minutes from the beach and between two major golf courses: Santana Golf and Mijas Golf and also close to La Cala Golf. The Residential area includes a sports centre, paddle tennis, tennis, International College. St. Anthony’s College, Spa-club a supermarket and several restaurants and just 35 minutes by car from Malaga International Airport. 30 minutes drive to Marbella and only 10 minutes to Fuengirola.